For 13 years, Recep Tayyip Erdogan has worked to impose his Islamist vision on Turkey's proud secular democracy, reshaping the country into a neo-Ottoman republic. His success can be credited in no small measure to his manipulation and intimidation of the press, and the occasional censorship of social media and the Internet overall. Now, in a gesture that betrays either Islamist imperialism, sheer ignorance of Western democracy, or both, Turkey's president and former prime minister is expanding his reach, raising his fist – and, he hopes, his influence – at the West, using the New York Times as his target. Infuriated by a "shameless" May 23 Times editorial that called him "increasingly hostile to truth-telling" and accused him of "brute manipulation of the political process" in the upcoming June 7 elections, Erdogan accused the paper of "overstepping the limits of freedom" and "meddling in Turkish politics." Speaking in Istanbul on Monday, the Turkish leader called on the Times to "know its place," and alleged that if the paper were to criticize U.S. leaders, those leaders "would immediately do what is necessary" – an ominous suggestion that spotlights his own way of dealing with journalists who say things he doesn't like: he puts them in prison, often on charges of "terrorism." In 2013, the Committee to Protect Journalists cited Turkey as the leading imprisoner of journalists for the second year in a row. The release of eight of those journalists in 2014 put the country in second place, but signs are strong that 2015 will see the country take the lead again. Indeed, only days after his rant against the Times, Erdogan took revenge on former Times reporter Stephen Kinzer, revoking his promise to grant him "honorary citizenship" and instead calling him "an enemy of our government and of our country." That change of heart appears to have come when someone on the president's staff uncovered a Jan. 4 article Kinzer penned for the Boston Globe, in which he observed, "Once seen as a skilled modernizer, [Erdoğan] now sits in a 1,000-room palace denouncing the European Union, decreeing the arrest of journalists, and ranting against short skirts and birth control." This is hardly the first time Erdogan has wrestled with the "Gray Lady." In 2014, the then-prime minister refuted the Times' report that Turkey had allowed weapons to flow into Syria to aid ISIS. 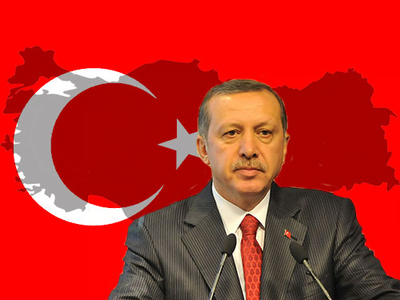 Turkey, he insisted, "is against terrorism of all kinds, indiscriminately." It was an ironic statement at best, coming from a man with Muslim Brotherhood sympathies who is also the leader of a country that allegedly serves as a Hamas headquarters. It is also worth noting that while Erdogan called Kinzer an "enemy of the government," he openly welcomed members of the Brotherhood expelled from Egypt after the fall of Mohamed Morsi. But it wasn't just the article Erdogan found problematic, he also criticized the Times' use of a photograph of him exiting a mosque, claiming it suggested that he and the mosque were responsible for recruiting jihadists for ISIS. The paper subsequently apologized for the image, saying it was "published in error." That led Erdogan to crow locally that he had triumphed over the Times – and so, he meant to suggest, over America. Similarly, in the aftermath of the latest Times conflict, he warned that the Times no longer rules Turkey: "They are used to ruling the other side of the world from 10,000-15,000 kilometers' distance," he declared. "But there is no such Turkey. There is no more old Turkey. There is a new Turkey." It was a typical Erdogan gesture: he often seeks that kind of triumph – not only over America, but over the entire world. He has famously stated that Muslims, not Columbus, discovered America, a position he defended with the assertions that "as the president of my country, I cannot accept that our civilization is inferior to other civilizations," and that "Western sources shouldn't be believed as if they are sacred texts." At speeches in Europe, he has exhorted Turkish-Europeans to resist assimilation. "Assimilation is a crime against humanity," he told an international audience of 20,000 who attended his 2008 speech in Cologne, Germany. And in 2013, in a highly controversial move, he demanded that the Dutch government place Turkish-Dutch foster children only in Muslim homes – despite the fact that there are few Muslim families offering to house foster children. Much about Erdogan's vision, in fact, can be read into this reinstatement of Ottoman Turkish; as the Washington Post observed, his opponents have taken the move "as a sign of the creeping Islamization of Turkey's resolutely secular society that has taken place under Erdogan's watch. Bans on headscarves and veils have been lifted by Erdogan. The number of students studying in state-run religious seminaries has grown from 63,000 in 2002, when Erdogan first came to power, to nearly 1 million today – a statistic the Turkish president celebrates." Not for nothing did Erdogan promise early in his administration to build "a new religious youth." From all of this emerges a confused, somewhat bizarre understanding of the role of the written word, be it in journalism or religious text, and a confusion between the two. It is forbidden to criticize Mohammed, for instance, but it is equally forbidden, evidently, to criticize Turkey's president (as it is the leaders of most, if not all, Muslim countries). Indeed, a 16-year-old schoolboy was arrested last December on charges of insulting the president over comments defending secularism and alleging government corruption. In an Islamist society – that of political Islam – there is no distinction between Islam and the state: to criticize one is tantamount to criticizing the other. In the same way, Erdogan's aim of creating a "new Turkey" that restores the Ottoman Empire and is more powerful than America or Europe, is akin to the ideal of a world Caliphate – a world under Islam. Already it is plain that, as he gradually erodes the legacy of a secular Turkey, increasingly he paves the way for the sharia state he has reportedly advocated in the past. What he may not realize is that the harder he tries to silence these truths, the clearer he makes them.